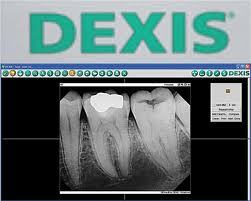 Our office utilizes high definition digital radiography by Dexis, the latest technology available to take dental x-rays. This technique uses an electronic sensor instead of x-ray film that captures and stores the digital image on a computer. The image is then instantly able to be viewed, then can be enlarged or enhanced in order to help us detect problems more accurately. Digital x-rays also reduce the radiation by an additional 80-90%, compared to the already low exposure of traditional x-rays. Dental x-rays are essential, preventative, and diagnostic tools that provide valuable information not always visible during a clinical dental exam. Using digital dental images are the safest possible way for us to be able to accurately detect hidden dental abnormalities, and in turn, we are able to complete an accurate treatment plan. Without these images, problem areas will often go undetected. Detecting and treating dental problems at an early stage will save you time, money, unnecessary discomfort, and your teeth! We are all exposed to natural radiation in our environment. Digital x-rays produce a significantly lower level of radiation when compared to traditional dental x-rays. Not only are digital x-rays better for your health and safety, the sensor used is usually more comfortable in your mouth than the traditional x-ray film. Also, since the digital image is captured electronically, there is no need to develop the x-rays, thus eliminating the disposal of harmful waste and chemicals into the environment. We recommend a full mouth series of dental x-rays be taken every three to five years. Bite-wing x-rays (x-rays of the top and bottom teeth biting together) are recommended at least once per year so that any new dental problems that arise can be detected at a relatively early stage.